Walsall have parted company with head coach Sean O'Driscoll after just 16 games despite sitting fourth in League One, after a winless six-game run. The 58-year-old took charge in December after Dean Smith's move to Brentford, with the club third in the table. But form dipped after winning his first three matches and he has left the club following Saturday's loss to Barnsley. "The players' performances over the past month have not gained the points they deserved," said O'Driscoll. "This is a different phase of the season and, as we have repeatedly seen, teams have recognised the team's strengths from the first half of the campaign and prepared to counter that when facing us. "But the players deserve enormous credit for adapting, finding different ways to play and maintaining their performance levels even, at times, in the face of frustration and disappointment." Despite their poor run of form, the Saddlers are only five points off the automatic promotion places and have a seven-point cushion above Coventry, just outside the play-off places in seventh. After Smith left for the Championship, they spent three matches under the joint-caretaker management team of physio Jon Whitney, goalkeeping coach Neil Cutler and former Bristol Rovers, Cheltenham and Colchester boss John Ward before O'Driscoll's appointment. 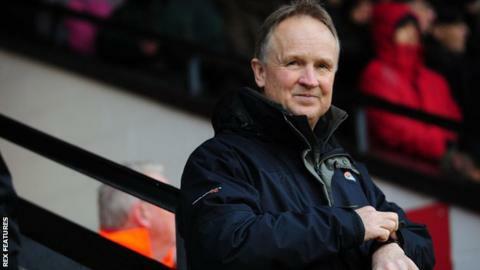 "It's a decisive move from Walsall to relieve Sean O'Driscoll of his duties only three months in. But it really wasn't working out. "Also the Saddlers are making the change when there's still a chance of promotion - even automatic isn't out of question. "We could well see existing coaching staff carrying the club forward for rest of season under the canny eye of John Ward."